It may seem counterintuitive for those living in eastern North America, but the continuing trend of warmer months globally has officially culminated with the 2014 as the warmest summer on record, according the the National Oceanic and Atmospheric Administration’s most recent State of the Climate report. This following last August as the warmest on record, beating the previous record set in August 1998. In fact, nine of the past ten record warm Augusts have occurred in the 21st century. Global combined land and ocean surface temperatures for the June-August period of 2014 were 1.35° F warmer than the 20th century average of 60.1° F, again edging out the extreme El Niño year of 1998. 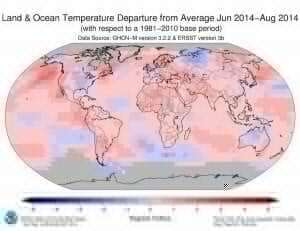 Most, but not all, of the globe’s land surface experienced warmer than average temperatures. Weather stations in Russia and the United States reported both record warm and cold temperatures in August. As noted above, the eastern U.S. had a relatively cool summer, while record heat and drought prevailed in the American west. After an eight-month streak of warmer than average temperatures, the UK had the coolest August since 1993. Parts of Asia and Australia also experienced cooler-than-average temperatures in August. Driving the overall record heat was the world’s oceans, with the average sea surface temperature for August 1.17° F higher than the 20th century average, passing the previous record for ocean heat set in 2005. The August temperature anomaly represents the highest departure from average for any month in the 135-year record. The previous record anomaly was set just two months prior in June. The period for June-August also hit a new record as global ocean surface temperatures topped 1.13° F above the 20th century average. The trend toward increasing global temperatures, especially in the world’s oceans, remains clear.